Whether you are working in China, or working in the US with the need to commute with clients living in China, you will inevitably run into this issue: you can’t transfer more than 25MB of files using WeChat. Generally speaking, large file transfers can be challenging because major storage solutions in the US and worldwide such as DropBox, Google Drive, Box aren’t permitted in Mainland China. For those of you who haven’t heard of WeChat, “WeChat's reach and influence is unrivaled in China's online space," said research firm China Skinny. "It touches everything from consumers communicating with their nearest and dearest, to sharing their most special moments, to buying everything from cinema tickets to taxi rides." according to Business Insider in 2015. Over the years the app has only become much more powerful. When you try to transfer files over 25MB using WeChat, you are stuck! This is a dealbreaker for those who work in creative - think large image files, client presentations, and ANYTHING related to videos. Even if it’s just a teaser video of 60 secs, at a high enough resolution you’ll have no luck transfer it over. Sure, one alternative is to reduce the quality of the video significantly. For that, you can use apps such as Video Compress. This app significantly reduces the quality of your video so it can be sent at a smaller size. This article is about transfer/sending files larger than 25MB. However, WeiYun has a pretty good mobile app under a different name called “Tencent Drive”. The mobile app is 100% in English. 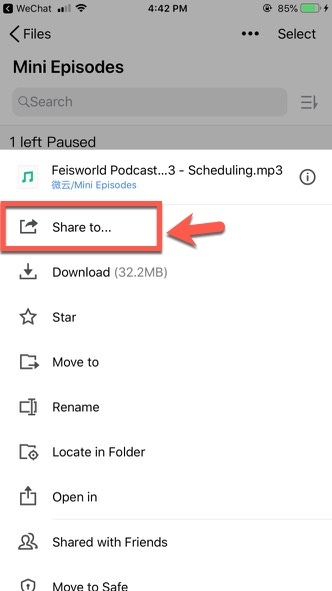 If you follow the steps below, you will be able to navigate the shortest way through WeiYun, get your files uploaded and share with your people. Step 2: Install Tencent Drive (app) on iOS or Android - see icon below. Step 3: Open Tencent Drive, and then select the WeChat icon in towards the bottom of the screen. This is asking WeiYun to log in using WeChat so you don’t have to create another account. Step 7. An example of how we use Tencent Drive after creating folders and uploaded a number of our video files to Tencent. Note: if you are new to WeChat and have never added a contact/friend, follow this video below. It’s straightforward. After you share a Tencent file - this is what you will see in the chat window you both share. Please note: your contact will NOT be able to save the file directly onto her mobile phone. The available options are listed as above. In order to save the file to her mobile phone, she must also have a Tencent Drive account and do it directly within the app. 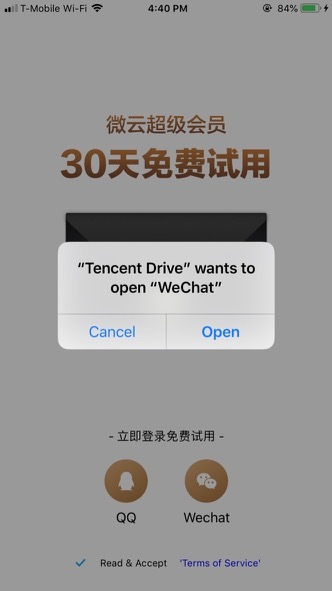 BONUS - How you can more easily access your Tencent Drive files directly in WeChat, WITHOUT having to open the Tencent Drive app each time. The Tencent official account looks like this below - click “Follow” to move onto next steps. Hope you find this article helpful! If you have further questions about WeChat or using Weiyun for file transfer, please drop your comment below.